Paulina Ellis, from Edmunston, New Brunswick, is a one woman band in reference to her Sacred Sound Odyssey performances. 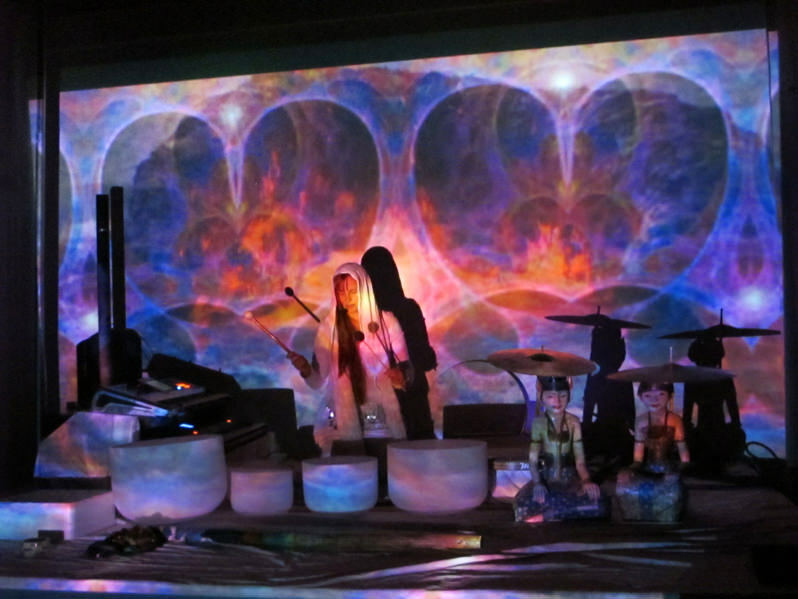 Intuitively creating a soothing soundscape from a collection of crystal bowls and exotic musical instruments, she fuses sacred sounds and inspirational images in a unique hologram performance, whereby the viewer is transported on an inner journey (one that is both hypnotic and liberating) of harmony and alignment. Paulina’s expression of the Divine Feminine in form, sound, light and sacred geometry is beautiful, haunting and healing. Connected to the energy of Mother Earth, you are carried into the expanse of the universal flow. This Odyssey, then, becomes an immersion of self into pure vibration. It was an honor, a blessing and a privilege to be able to attend two Sacred Sound Odyssey evenings (July 30 and 31, 2013) on the west coast of Newfoundland. In addition, purchasing a copy of the Crystallina CD has helped me recapture the sacred experience of sound and vibration.